The dossier of the Climats of the Bourgogne wine region – along with that of the wine houses, hillsides and cellars of Champagne – has just been approved by the government to represent France at the 39th session of the UNESCO World Heritage Committee which takes place in Berlin in June, 2015. Their selection will fly the flag for French winemaking on the international stage. These two dossiers are not in competition. Each serves to highlight the other’s strengths. In their own fields, the Bourgogne and Champagne regions each represent a quintessential originality, as universal references in the world of vines and wine. For the past six years, the Bourgogne region has been working hard to ensure this unique conception of terroir gains international recognition. The important scientific work that has been undertaken has ensured this notion is clearly understood and backed up. For centuries, the Climats have intimately linked each wine with its place of origin. This has resulted in wines whose sophistication, nuances and originality are acknowledged around the world. This was clearly illustrated once again by the Hospices de Beaune wine auction in mid-November. “The Bourgogne region is a model in terms of terroir winegrowing for winemakers around the world. Underlining the value of origins is not synonymous with an inward-looking approach – on the contrary! 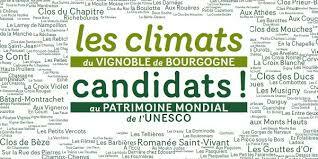 The Bourgogne winegrowing region exports more of its wines than any other winegrowing region in France (around 50%),” said Pierre-Henry Gagey, Co-President of the Conférence Territoriale management body. The application has also enabled the region to forge links with other UNESCO World Heritage sites, such as the Chinese tea-producing villages in Fujian province. Once the submission of the dossier has been made official (by end January 2014), the process goes on. In fall 2014, experts appointed by UNESCO will visit the region to examine its candidacy. Their report will be added to the dossier with a view to classification in 2015.